Problem: We are having agitators with soft starters. There is MCCB than Fuses and then soft starter. The problem is that at the time of starting, the fuses got blown. The motor Kw is 160. Earlier the fuses were of 450Amps semiconductor type. We increased the fuses rating to 550Amps. But now the frequency of fuse blown is reduced but has not gone. Should we go for further fuse rating? Or could we bypass the fuses and be on the MCCB? Answer: If you're drawing more than about 1.5 * (rated steady state current), your soft starter is not doing its job correctly. The idea behind the soft starter is to adjust the voltage seen by the motor to limit the inrush current to an acceptable (programmable) level. Typically, this is somewhere between 110 and 150 percent of the rated steady state current. To do this means adjusting the motor terminal voltage DOWNWARD - which has an adverse affect on developed torque. What this means is that the motor will draw less current at reduced voltage (relatively linear relationship, 80 % volts limits inrush to 80 % of full-volt condition). But torque is reduced by the square of the voltage (torque at 80 % volts is only 64 % of full-volt condition). Your job is to juggle the torque against the current to provide the optimum solution for acceleration of the driven equipment. The fluid density of the material being agitated is a factor in the required torque to operate continuously and to accelerate from standstill. Initially, the motor is designed to develop a specific amount of acceleration torque - which is defined as the difference between the developed motor torque (proportional to voltage, remember?) and the required load torque (which is proportional to fluid density and temperature, among other things). Sounds to me like a couple of things are happening at once: the soft starter is not doing its job of regulating the inrush current (by adjusting voltage) correctly. And the required load torque has - probably - increased significantly to a point where the motor can no longer adequately accelerate the load. This may be due to insufficient torque (regardless of applied voltage), or perhaps insufficient voltage applied to develop acceleration within the thermal (time) parameters of the control scheme. I think that it is necessary to also look at the load i.e. driven equipment and the following salient points. 1. The equipment is Agitator, which is like centrifugal Pump and whose Torque demand goes up in parabolic nature (increases in square of speed). 2. The density of the liquid in Agitator need to be checked as the same may tend towards slurry, demanding more torque with speed. 3. 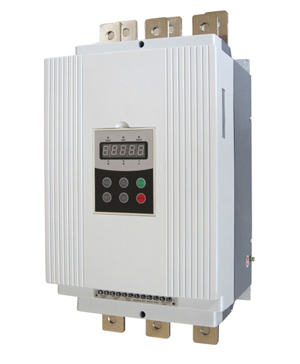 The system is provided with a Soft starter which normally applies reduced voltage to start and then progressively increase the voltage with increase in speed. 4. The reduced voltage may not be producing sufficient Starting torque (especially when the liquid is turbid or heavy) and if the increment of Voltage is not affected from the speed feedback the motor is likely to take higher current for longer duration & move towards locked rotor current. 5. Semiconductor Fuses are not suitable for long duration overload current and hence it blows off to save the diode or thyristor. At soft starters which operate in heavy duty, (high torque at acceleration) the best operation is the current limitation starting way. No voltage ramps, no current ramps, only current limitation. This case motor starts as fast as possible with limited current, and fuses will have less load. You set current limitation to 3.5 x In, and if you see, motor don't accelerate, rise it to 4 x In or more. If you set startup ramps, during the time while the voltage don't reach 70% of In, motor will have not enough torque to start, but fuses will be heated (loaded). You will have less time to accelerate the motor when it will have torque enough and fuses blow out. Be careful, motor start 1-2 times in one hour.